The so-called Islamic State has claimed responsibility for two suicide bomb attacks in Beirut that left at least 43 people dead and more than 240 wounded. The bombings took place in a crowded residential district in the Lebanese capital's southern suburbs - a stronghold of the Shi'ite Muslim group Hezbollah. The attacks come at a time that Hezbollah is stepping up involvement in the Syrian civil war, sending hundreds of fighters to support President Bashar al-Assad's forces in the conflict with mostly Sunni insurgents, including IS. The action has prompted Sunni Islamist threats against the Iran-backed group. Thursday's blasts struck a community centre and a nearby bakery in the commercial and residential area of Borj al-Barajneh, according to security sources. Despite a multitude of factors which suggest the country will fall apart Lebanon defies the odds and manages to stay together. A sandstorm has swept across parts of the Middle East, killing two people, leaving hundreds in hospital and disrupting fighting in Syria. The Middle East is on edge tonight after a missile fired by Hezbollah fighters at a military convoy killed two Israeli soldiers. It is the Islamic Militant group's most deadly attack on Israeli forces since their five week war nearly a decade ago. Israel has promised to do whatever it takes to defend itself. The United States has condemned the deadly attack by Hezbollah on an Israeli military convoy that killed two Israeli soldiers, and urged both sides to "refrain from actions that could escalate the situation", according to Reuters. "We urge all parties to refrain from any action that could escalate the situation," State Department spokeswoman Jen Psaki told a daily briefing. A Spanish UN peacekeeper was also killed, but it is not yet known which side is responsible for his death, a UN spokesperson said. The Spanish Prime Minister has expressed his "deepest sympathy" to the family of the Spanish UN peacekeeper who was killed during fighting near the Israeli/Lebanese border earlier today. In a Spanish-language tweet, Mariano Rajoy Brey said: "My deepest sympathy on the death of Spanish military in Lebanon . My love and condolences to his family and companions." Those responsible for the deadly attack on an Israeli military convoy near southern Lebanon "will pay the full price", the Israeli prime minister Benjamin Netanyahu has said. Mr Netanyahu was speaking ahead of consultations with Israeli security chiefs on further military response to the Hezbollah assault. The United Nations peacekeeper killed in southern Lebanon today was Spanish, Associated Press has reported. Zeina Karam, AP's Beruit Bureau Chief says that the Israeli ambassador has called Spain's foreign minister today offering condolences for the death of the UN peacekeeper. The peacekeeper, serving with a UN monitoring force in southern Lebanon, was killed as Israel responded with air strikes and artillery fire, a UN spokesman and Spanish officials said. Lebanon has said that it is still committed to the UN resolution that ended a war between Israel and Hezbollah in 2006. "The Lebanon reaffirms its commitment to Security Council resolution 1701," Prime Minister Tammam Salam said in a statement published by Lebanon's National News Agency, according to Reuters. 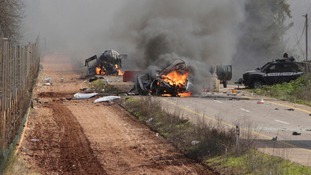 Salam's comments come in the aftermath of a Lebanese Hezbollah group attack on anIsraeli military convoy, which prompted retaliation from Israeli security forces.